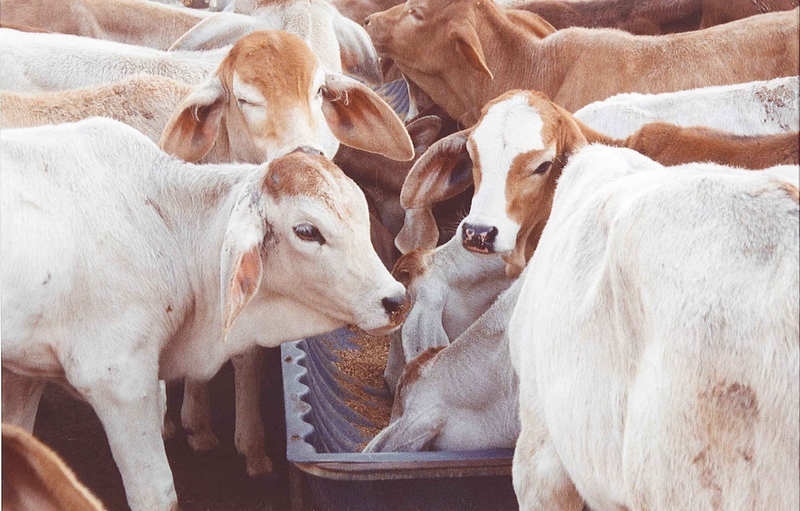 Supplementation is the most critical aspect of successful weaner management. Supplementation type should be based on weaner age and weight, which will determine nutrient requirements and intake levels. The objective is that weaners gain weight. To achieve weight gains of 0.5kg/head/day the total weaner diet on offer needs to be nutritionally balanced, palatable and digestible to satisfy required daily intake. Supplements should be available to weaners as soon as they are drafted off their mothers. Interruption to feed supply for weaners can compromise the weaner’s immune system precipitating coccidiosis. The best control of coccidiosis is to ensure adequate feed intake and growth of weaners. With proper management and nutrition, there is no growth disadvantage of small weaned calves compared to their similar unweaned counterparts of the same age. Weaners should have access to good quality hay in addition to the supplement while they are in the yards. Good quality hay has a high proportion of leaf to stem, is green and sweet smelling. Hay containing legume leaf is usually more nutritious and digestible than hay made from grass alone. Hay with too much legume (as in pure lucerne hay) often causes scouring in weaners. Hay should be clean and free of mould. Be careful when purchasing hay from areas with widespread declared weeds. Weedy hay will be less nutritious (and a biosecurity risk). When reading the product label of calf meals/pellets, do not include urea in the calculation of crude protein. Young calves cannot utilise urea as their rumen is not fully developed. Suitable protein sources for weaners include cotton seed meal and copra meal. Younger weaners may perform better on copra meal. Segregating weaners on size reduces bullying and allows all weaners to get a fair share. Feeding pellets or protein meals every third day (or twice a week) results in plenty of feed available on the day, and reduces bullying. Feed concentrate supplements before putting hay out so as the weaners eat the concentrate first. Do not change the amount or type of feed suddenly. This gives the rumen microorganisms a chance to adjust. Include Rumensin® (active ingredient monensin) in weaner rations to achieve an intake of 25mg/head/day. Rumensin may also help control a coccidiosis outbreak. Care should be exercised as over-dosing is quite toxic. Note small amounts in horses can be lethal. Urea must be thoroughly dissolved into molasses supplements to avoid toxicity. Mechanical mixes should be used. Take particular care with granulated urea. Calves of <100kg liveweight must have continual access to concentrate supplements. Monitor intakes of weaners to ensure adequate intakes of supplement are achieved. Phosphorus should be included in supplements fed to weaners on phosphorus deficient country, in both the wet season and the dry season. When feeding dry licks and blocks to weaners over 150kg, the lick should supply 75g of protein per head per day. If weaners are not eating enough, protein meal can be added to improve palatability of the lick. The following table is a guide to the type of supplements different size weaners should be fed to achieve target growth rates. Milk replacer and high quality baby calf meal or pellets (18% or 20% protein) including Rumensin. Free access to good quality hay. Calf meal or calf pellet (16–18% protein) including Rumensin. Free access at all times to good quality hay. *MUP = a mixture of molasses + 3% urea + 8 to 10% protein meal. **M8U = a mixture of molasses + 8% urea (it is essential to use a mechanical mixer). ***MP = molasses + protein meal. ****Protein/energy mixes = protein meal + grain + urea (small amounts). Proprietary mixes should be fed according to manufacturers recommendations. Rebecca Gunther, Department of Agriculture and Fisheries, and Felicity Hamlyn-Hill, formerly Queensland Government.